In our final part of our jigsaw review series we will ultimately get to the main question on what jigsaw you should buy? This is the 4th part of our jigsaw review article series. Part 3 can be found here: Jigsaw Review - Finding the best Jigsaw. 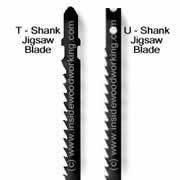 Jigsaw Blades - T-Shank or U-Shank ? T - Shank Jigsaw Blades originally designed by Bosch (Scintilla). Bosch jig saw blades with there conical shank top, holds the blade by a vertical screw mechanism. Since it can also be held by horizontal blade fittings, it’s a universally usable shank type. Most jigsaws on the market can hold T Shank blades. U- Shank Jigsaw Blades where originally mainly found on Black & Decker jigsaws. The U-shank allows the blade to be horizontally screwed to the jigsaw shank. U-shank jigsaw blades are very common in North America, but carry the disadvantage of being difficult to fit into Bosch jigsaws. This limits their usage to certain models. What Jigsaw Blade Shank Type Should I go for? The craftsman and professional woodworker should purchase a jigsaw that holds at least T-shank jigsaw blades. You’ll discover that most manufacturers offer this. As your first choice buy T shank replacement blades, especially if you prefer a Bosch or Festool jigsaw. These brands might not be able to accommodate U-shank blades. From the beginning make certain these types of blades will fit the jigsaw models you’ve purchased. Circular Cutting Guide. Usually a simple metal bar with a pin on one end fits to the Foot of the jigsaw. The mechanism allows for circular cuts. Perhaps it is also useful for rough quick cuts. Professionals might use alternative tools and machinery for this task (bandsaw or cnc router). Dust Extraction Kit. Some jigsaw manufacturers sell this kit as an add-on. Some high-end models have this kit already included. The kit usually allows a vacuum cleaner to hook up to the jigsaw. Remember that dust extraction is becoming an increasingly important part for any professional, especially when working on site. Worth having a look at. Carrying Case. This is very important! Some will tell you that carrying cases aren’t important (for some type of power tools), for your jig saw, these cases are key for safety and preservation of the equipment. Apart from storing your saw properly, it is normally the number one place to keep all your blades. Therefore, be certain to use your professional jigsaw with a solid carrying case with space to store all jigsaw blades and accessories. What Jigsaw is Right For Me? What Jigsaw Should I Buy ? Depending on you intend to use the jigsaw mostly for you will find "your personal best jigsaw" after reviewing it thoroughly. 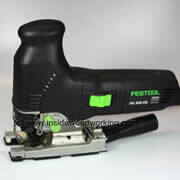 To me as a cabinet maker I use two corded jigsaws, a Bosch 1590 evsk and a Festool Trion PSB300 in my workshop. On both jigsaws I like the quick blade change mechanism and the precision blade guide. 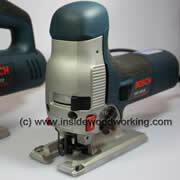 For more heavy duty work, I tend to use the Bosch more, but that's just my personal choice. Whenever you think about the purchase of a jigsaw for your workshop or home, you’ll want to be certain to check all important parts and features on today’s modern units. Remember, that not all new extras or accessories are genuinely needed. Some of these extras are really closer to gimmicks. You should compare key components like blade change mechanisms, blade guiding, the jigsaw foot and the gear case, prior to deciding which jigsaw to buy. With all the examined components and features a jigsaw could/should have, you should now go on and find out and evaluate for yourself what is it that you want to look for when you buy a jigsaw. From a reviewer point of view some of the above jigsaw components and parts might be more and others less important to you. On the next and final part of this review on how to find the best jigsaw we will look closer into jigsaw blades and sum it all up into a guide or detailed jigsaw comparison table. Read more here.